It’s a great idea to take advantage of these bright, hot Spring days. A lunch break is the perfect time to catch some rays during the busy weekdays. 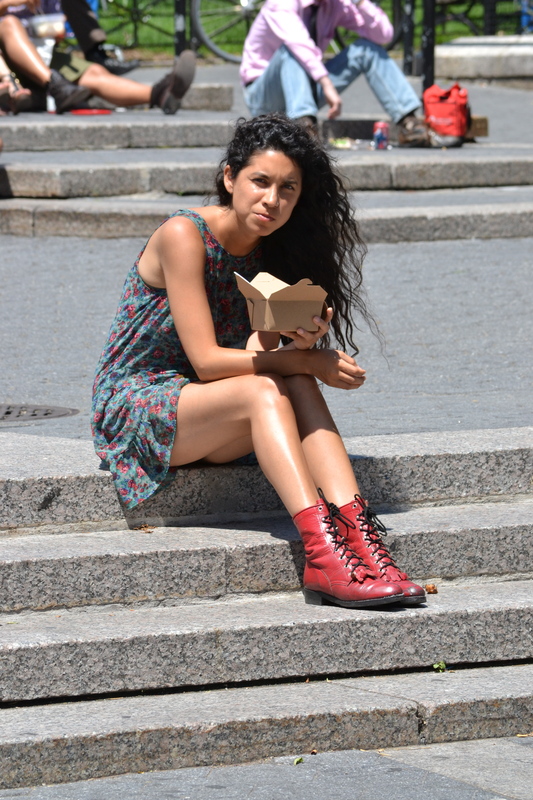 This young lady takes her break on the Union Square steps, enjoying the sun and some Whole Foods. She wears a blue sundress with a red floral print, which allows for maximum sun exposure. Her red military boots match the flowers on the dress, and give the outfit a unique style, not normally seen. Posted on June 3, 2012 by Capture the Streets	This entry was posted in Fashion From the Streets, Lifestyle and tagged clothing, fashion, New York City, photography, Photos, Street style, Women's Fashion. Bookmark the permalink.